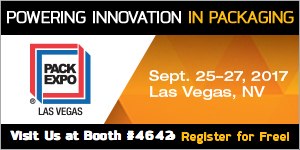 Pack Expo in Las Vegas is soon approaching and Ryson is pleased to be able to get you FREE access to the show. PACK EXPO Las Vegas brings together 2,000+ exhibitors and 30,000 attendees from virtually every vertical market, and is indisputably the year’s most comprehensive packaging event on the continent—and the one that powers innovation like no other. We hope to see you there and we are excited to reveal some new things to see at our Booth 4643. Click this link to find us in the exhibit hall. Click here to register for Pack Expo for Free! Simply click on the banner to the left and it will take you to the registration page and it will cost you nothing. Enter Comp Code 93T27 during the registration process and the registration fee will be waved prior to your checkout. This week we’re shipping our new Narrow Trak Spiral Conveyor to a confectionary manufacturer. The end-user needed a way to incline unwrapped cartons of chewing gum at high speeds while providing a smooth enough ride to prevent the packs from coming out of the cartons during transit to the overwrapper. Our Integrator Partner, Dillin Engineered Systems, would have typically used their belt-over-belt incline, but the angle of incline afforded by the space they had to elevate almost 9 feet, made it a risky option. They decided to use a Ryson NT Spiral instead, taking up only 50” in total diameter and it will be running at 220 feet per minute. This is an ideal application for The Ryson Narrow Trak Spiral Conveyor. It is specifically designed to handle smaller products that are too small to run on our regular size spirals. For more information on the Ryson Narrow Trak Spirals, please visit www.ryson.com or download the product specs here. Pack Expo will be held in Chicago, November 6-9. Visit the Ryson booth N-5528 to see two versions of our NT running. Please click here for more information. This week we are packing up all the equipment we will be shipping to Pack Expo in Chicago. We will have 5 pieces of equipment running in our booth. This includes 2 new versions of our Narrow Trak Spiral Conveyors. These Spirals are super compact vertical conveyors designed to handle small loads. Our nesting slats have the capacity to reliably end-transfer small cartons and packages or side-transfer small bottles or containers in a single file or in a continuous mass flow. The spiral conveyors are equipped with our new 6” and 9” wide nesting slats which provide an efficient flat conveying surface without gaps. These spirals can run at speeds in excess of 200 fpm. The Spiral with the 6″ wide conveying surface will be set up for side transfer to handle bottles and cans in a single file. This model will be a good alternative to side gripper conveyors because they can run at high speed and do not need to be adjusted for varying product sizes. The Spiral with the 9″ wide slats is set up for end transfer of products and will run a variety of product sizes. If you have a product you would like to test on our spirals, Ryson would be happy to test it during the show, or alternately we can test products in our shop and you are free to see it in person, or we can video tape it and send you a convenient link to view it. This is a courtesy we extend to all of our customers and prospects. Download the latest speck sheet for the Ryson Narrow Trak Spiral Conveyor. Pack Expo will be held in Chicago, November 6-9. Visit the Ryson booth N-5528. Please click here for more information.